I love this bike. Over the years I have built seven bikes for myself and one for my first wife. This one is the best. 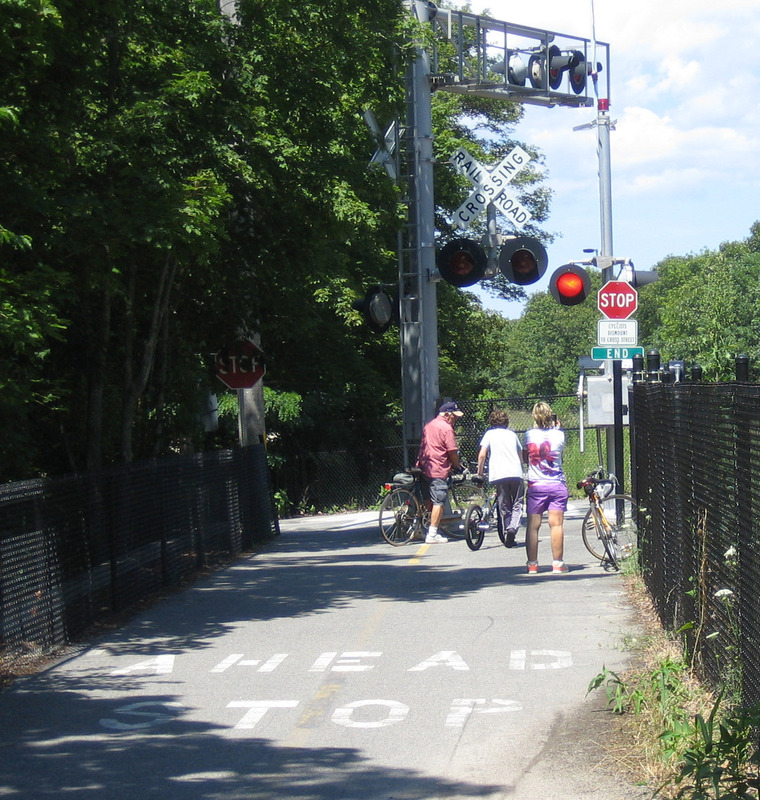 It is set up specifically for day rides on rail trails and bike paths. What’s special about this bike? The 62cm Surly Cross-Check frame fits me perfectly. 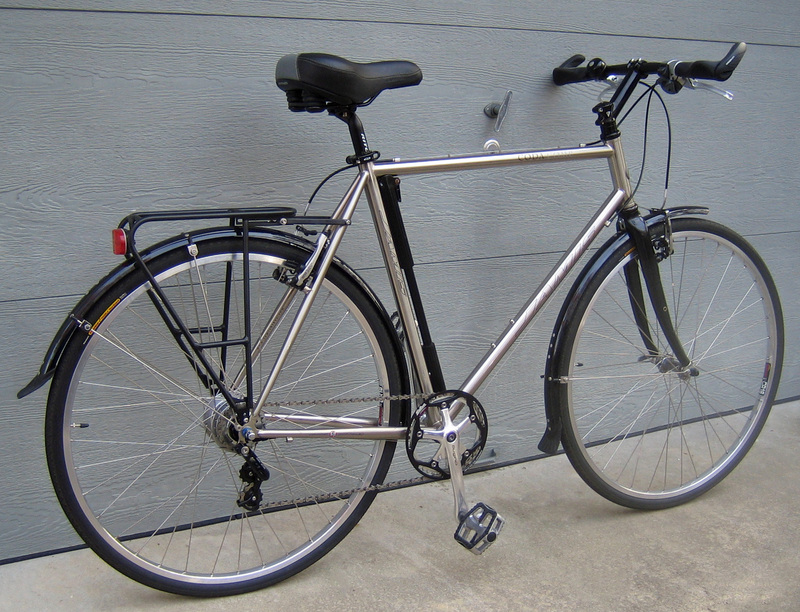 It has identical geometry to the Fuji tourer that I built up in 1985 and liked a lot. 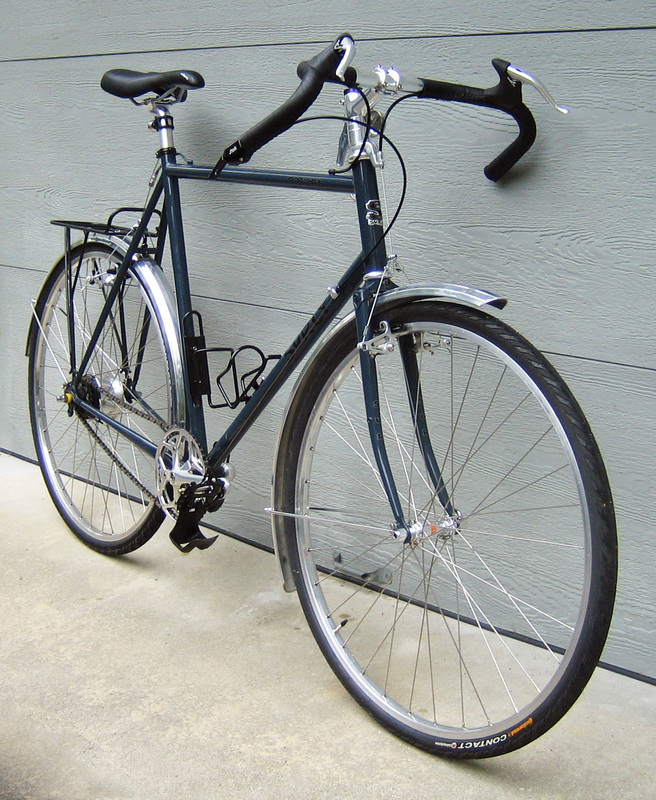 Like most good quality steel frames, it is rugged and lively. It also has horizontal rear drop-outs that allow use of an 8-speed Alfine internally geared hub without a chain tensioner. This rig shifts instantly and silently, whether I’m pedaling hard, coasting, or standing still, and avoids all the hassles and finicky adjustments of derailleurs. It is controlled by a Jtek bar-end shifter that is precision machined, made in USA, and clicks solidly into each gear. The 180mm cranks give me extra leverage with my 36″ legs, and the NOS Biopace chainwheel is easy on my knees. Because the chain is always perfectly aligned and does not shift from side to side, I can use a heavy-duty Wippermann Connex chain intended for fixies and single-speeds. The White Industries pedals are also precision machined in the USA. They are pricey but super smooth and patterned after the old Lyotard 23s, with large kick-tabs. 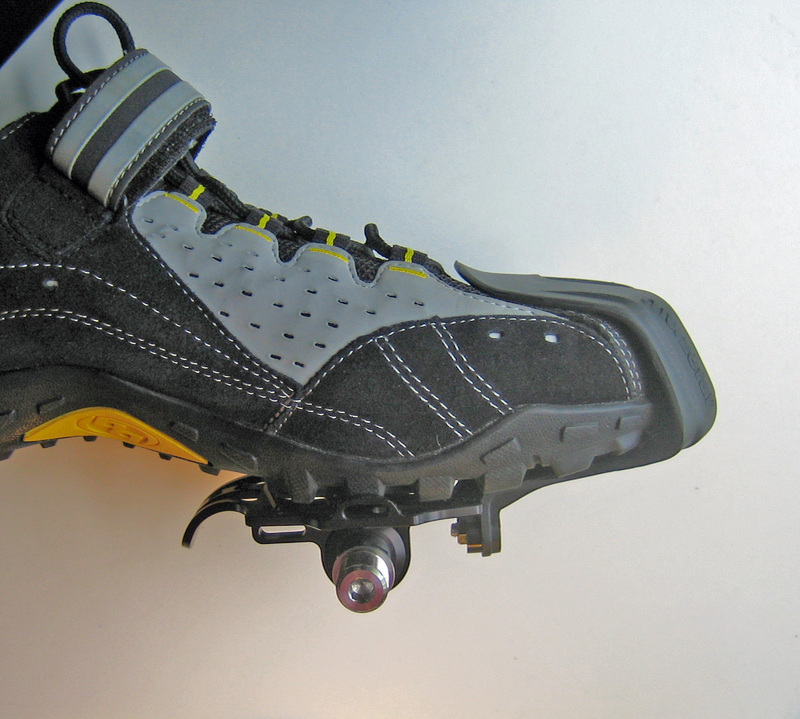 The Zefal Mountain toe clips hold my shoes snugly without straps and are easy to get in and out of. Since I bought these, MKS has brought out a similar pedal for under a third the price. For tires, I chose 37mm Continental Contacts. 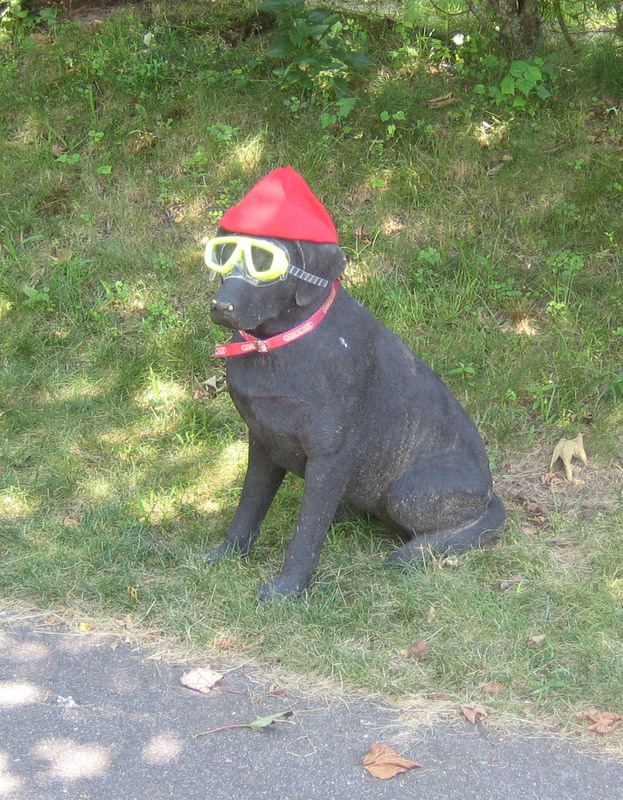 These can be inflated to 95 psi for fast moving on pavement, or softened to as little as 56 psi for use on crushed gravel. The Velo Orange sealed-bearing front hub is so smooth, a quick spin will keep it rolling for more than three minutes. The sealed-bearing headset and bottom bracket also came from VO, as did the stem, bar cover, and alloy fenders. 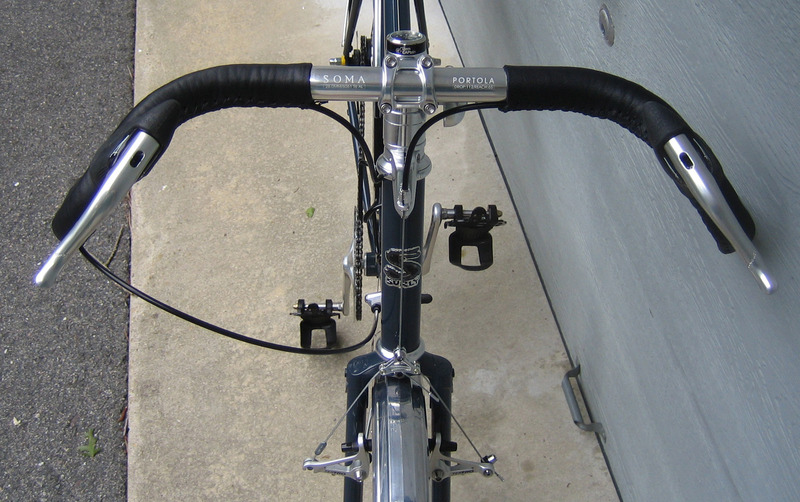 My favorite feature, though, is the wonderfully ergonomic Soma Portola handlebar. This bar feels natural and comfortable in all six hand positions. It is similar to my long-time favorite GB Tourist Bend, but 13cm wider and more flared on the drops. The 1985-vintage NOS Dia-Compe compact brake levers are perfect on the tight bend, and the VO elk hide leather cover provides a non-slip grip without feeling sticky. I’ve left the bar uncluttered by mounting the bell on a head tube spacer, and keeping a headlight in my rack bag for mounting on the rare times that I might need it. The little clock on the stem head has proven handy, and is easy to read even without my glasses. 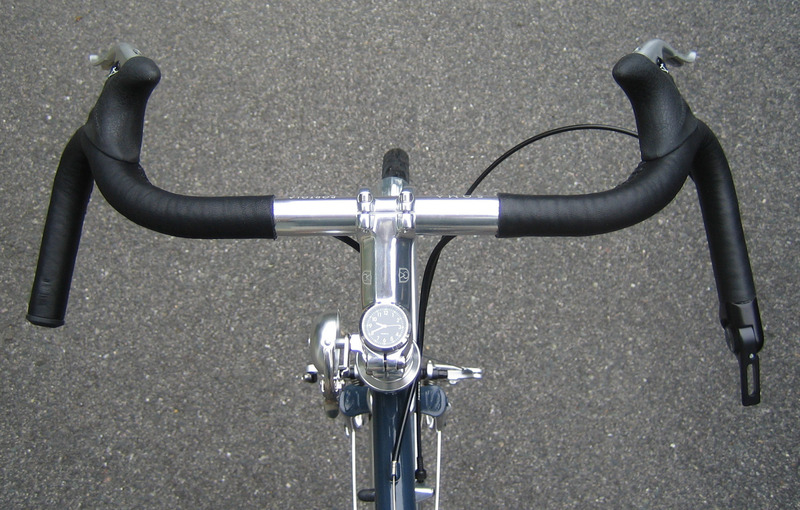 Not shown in these photos is a small rear-view mirror mounted on the left bar end. 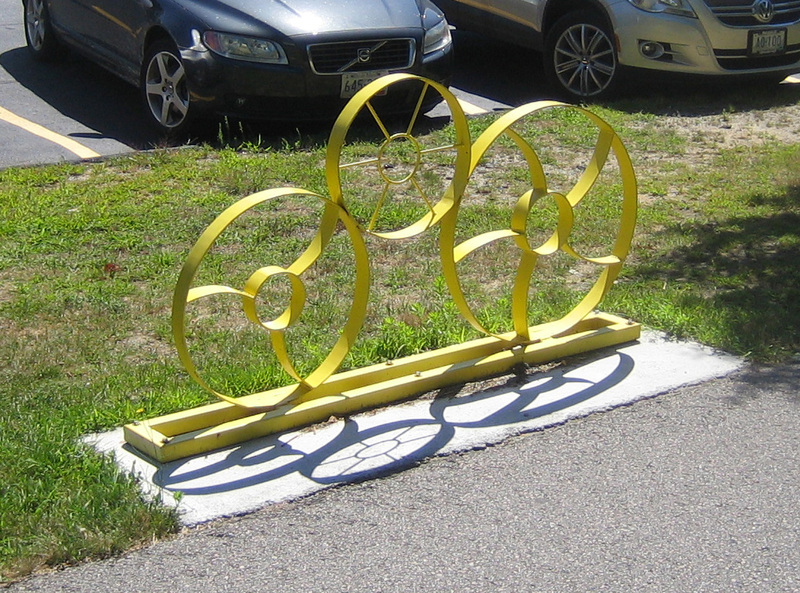 The rear rack is one of the earliest Blackburn racks. I bought it 40 years ago and have used it on four bikes. 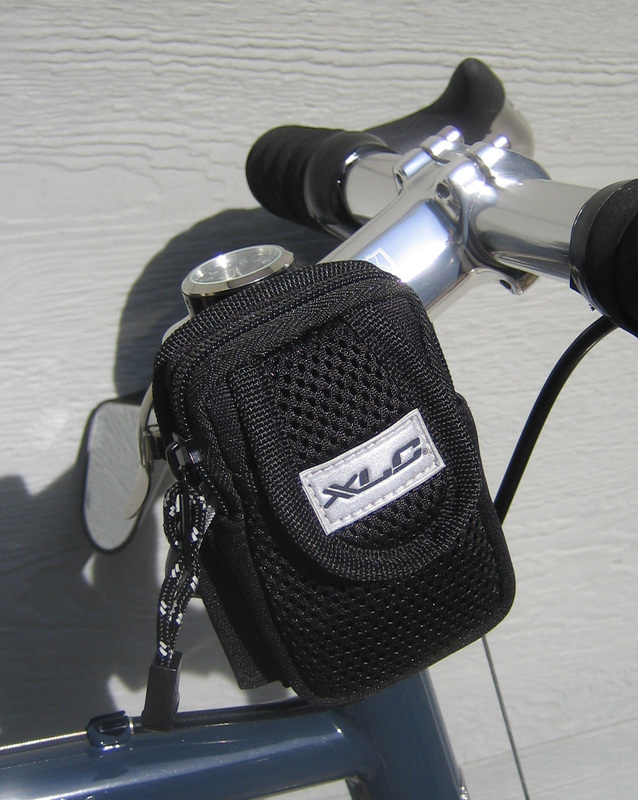 It is lower and lighter than the newer models, and perfect for my rack-top day bag. It was made to fit 127mm rear dropout spacing, so I bolted it to the inside of the dropouts on this frame, with its 132mm spacing. And despite the tall steel frame and geared hub, this bike weighs in a few ounces under 26 pounds, equipped as in the photos. Unlike most tricked-out tourers, it is deceptively simple – more like a fixie than a cruiser. You can see the full story about building this bike, with lots more photos, at https://twofootartist.com/surly-cross-check-trail-bike/ Left click on any of these photos to see them full-screen. I broke down my old Fuji and have been selling the parts on eBay. Sale of the frame, wheels, shifters, rear derailleur, and seat post covered the cost of my new frame. Still have some parts to sell, and expect to cover all costs of the upgrade, except for the new wheels on the Jamis. My brother is preparing to retire soon and talking of buying a new bike. The Jamis might fit him perfectly, as he is a few inches shorter than I am, and I won’t need it now that I have the Surly. He wants more gears, though, so I’m going to swap out the 5-speed hub for a Nexus 8-speed and put on a double chainwheel set. That will give it 16 good usable and different gears with a perfect half-step setup. Now that the Surly is done, I will finish the renovations on the Jamis for my brother to try and lace the Sturmey-Archer hub into the rim I took off the Jamis. I will then have an extra set of wheels, along with a crankset, fenders, seat, brake levers, and some other parts, which I am thinking of building into a new town bike if my brother takes the Jamis. Looking at a 60cm Pake C’mute frame and Soma Deco rack for that. I will document that build on a separate page if go ahead with it. Yesterday was a mostly-sunny day between spring snowstorms, so I took the Jamis out for a trial run around the neighborhood. I was pleasantly surprised to find the front derailleur and geared hub worked beautifully. This bike now has 16 distinct gears, in perfect half-step progression, all of which work with perfect or nearly-perfect chain alignment. The SRAM click shifter controlling the vintage Sun Tour Cyclone derailleur works as crisply as the Rapidfire shifter controlling the rear hub. A couple of things have come up that may change my plans. My brother drove up from Connecticut last week for my birthday. He loved the Jamis and thought it would be perfect for his needs and age. Unfortunately, it is at least an inch too big for him. He plans to try it out anyway, and I told him he could borrow it indefinitely until he decides what he wants in a bike. If he decides he doesn’t want it, I will probably sell it and build up the Pake C’mute. Then VO dropped the hint on its blog that it is working on a new frame design that will be a cross between their Campeur and a 29er for touring on unpaved trails. 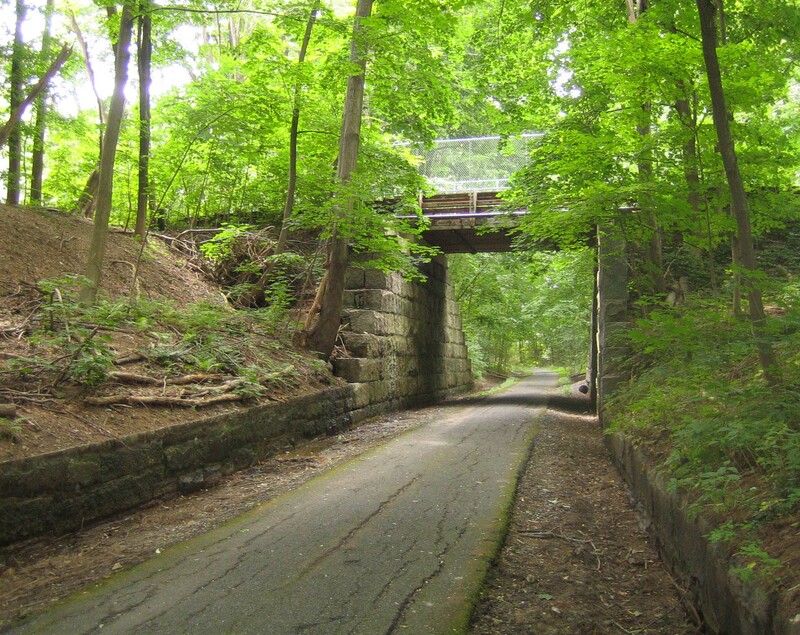 This sounds perfect for the overnight tours on the long crushed-stone trails that I want to ride in New Hampshire, Maine, and along the Erie Canal in upstate New York. Looks like that might be next winter’s project. Now that I’ve slipped into my eighth decade, I no longer do century runs, and rarely pedal where I have to share the road with cars and trucks. Where I live on Cape Cod, there is simply too much traffic, and too many drivers who are elderly, angry, distracted, or otherwise impaired. 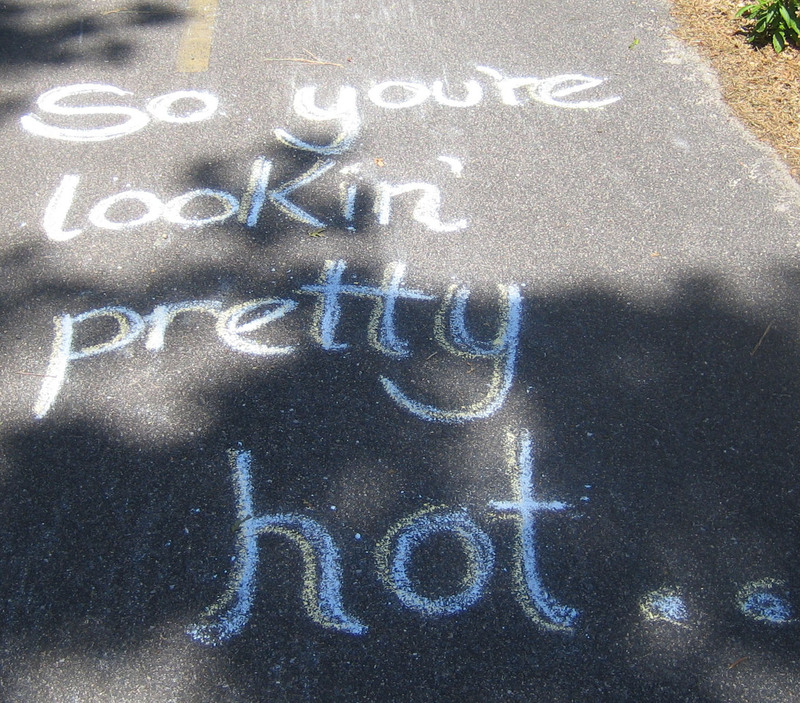 Fortunately, there are more than 60 miles of paved bike trails on Cape Cod. 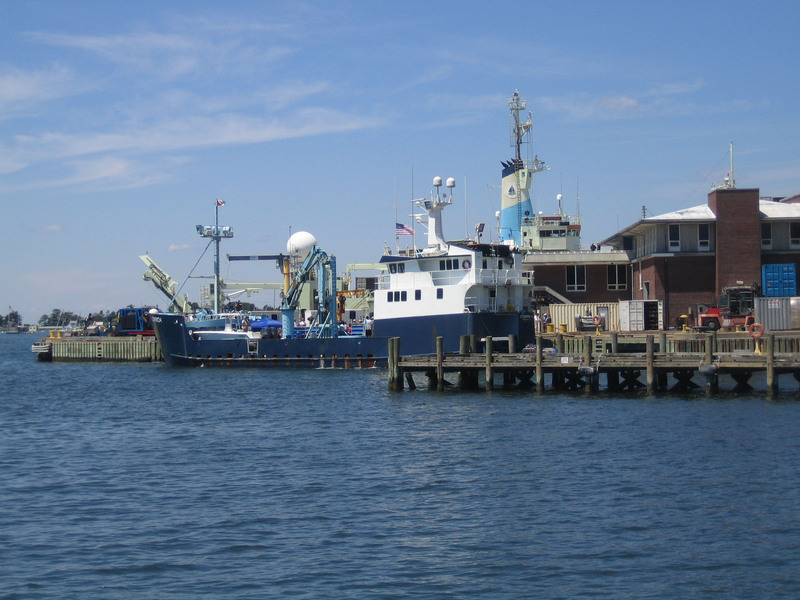 My favorites are the 10.6-mile Shining Sea Path between North Falmouth and Woods Hole, and the service roads that run along either side of the Cape Cod Canal. The north side road is 7.0 miles long and the south side is 6.5 miles. All three trails are within five miles of my house. There are several hundred miles of scenic trails within a four hour driving distance. 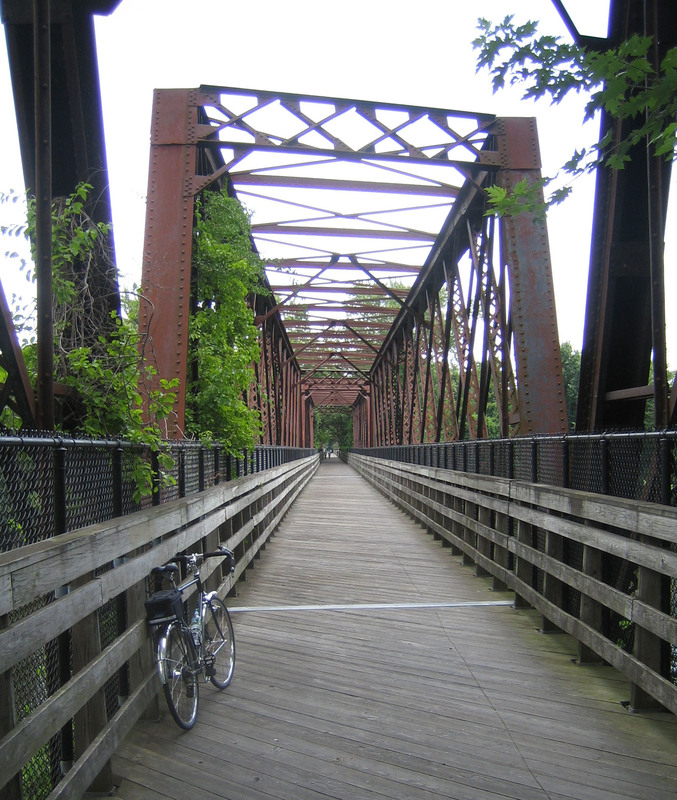 Last year I rode the Nashua River Trail and the Ashuwillticook Rail Trail in the Berkshires (see https://twofootartist.com/bikes-and-biking-year-two/). They are both comparable to the Shining Sea Path in length and scenic value. 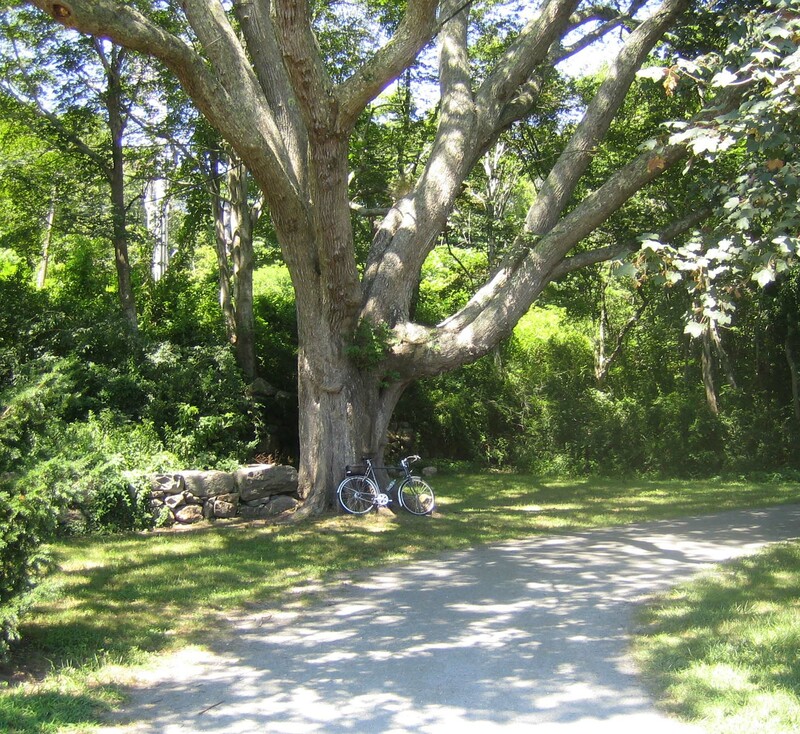 Next month – on my annual road trip – I plan to ride these trails again, along with several others in Massachusetts, Rhode Island, and Connecticut. Once the winter winds eased last March, I started taking regular short rides on my new bike. It was all going well until April 13th. That day was overcast, with a brisk southwest breeze, but I rode the Shining Sea Path anyway. 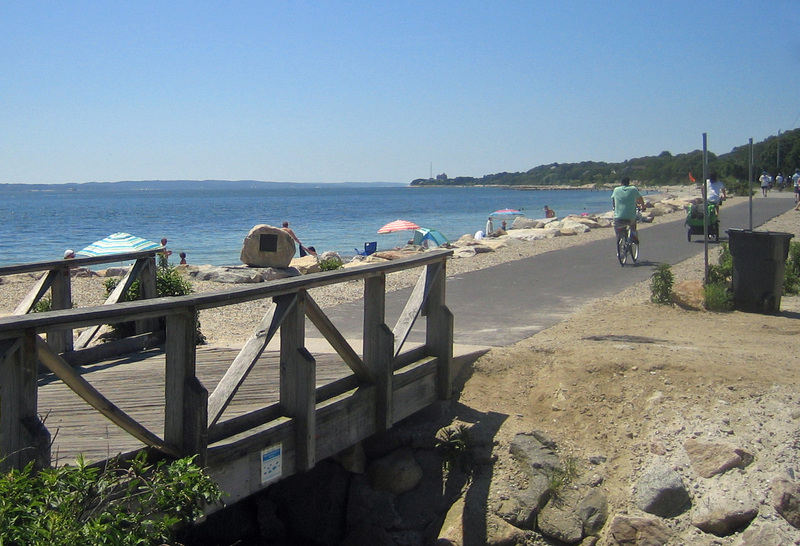 The new bike was such a delight to ride, and since it was early in the season when traffic is light, I decided to get off the trail at Chappaquoit beach and take the shore road back to North Falmouth. There are some short but steep hills on this route, and one long climb near the end, so I was able to test my hill-climbing ability. The 8-speed hub has a full range of gears, from a 28-inch hill climber to an 87-inch downwind gear. They all worked fine and I was having a great time. I noticed, however, that the slightly higher gearing than what I was used to made it feel like every gear was either a little too high or a bit too low. Apparently I pushed too hard too soon, though. 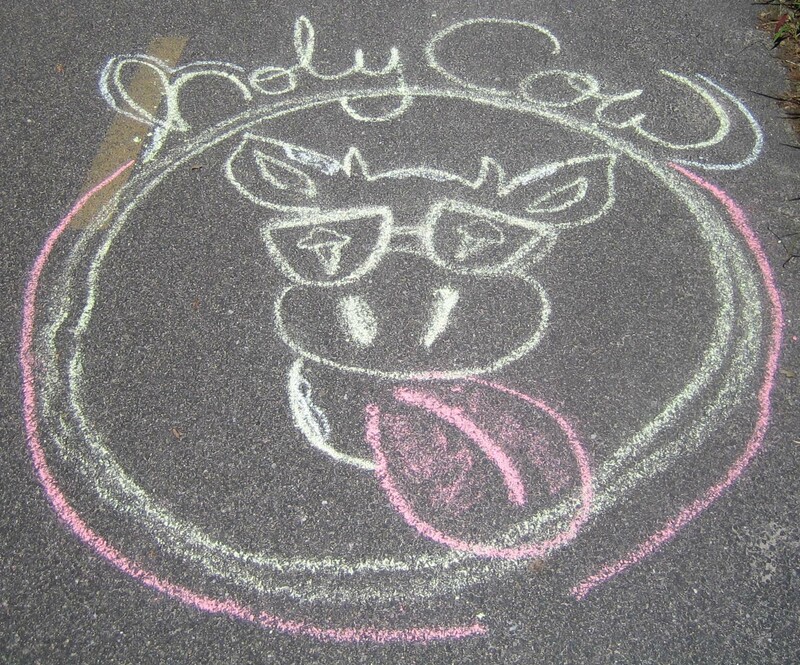 The next morning my left knee gave way, leaving me in constant pain for five weeks. I had torn a ligament in this knee while skiing six years ago. That tear took about a year to heal and kept me off my bike for several more years. So even though I didn’t think I was overdoing it with my April ride, I must have aggravated the old injury. I’ve been taking it real easy since getting back on the bike a few weeks ago, keeping my mileage down, spinning in lower gears, and staying on the level bike trails. I also changed out the rear sprocket to get back to gearing that I had been using the last two years, and lowered my saddle from 109% of leg length to 106%. So far, I have been able to do 12-13 mile rides with no adverse effects. I’m hoping to get back to doing 25 miles a day before my road trip in August. As elegant as the elk hide bar wrap is, it offers no cushion from road vibration. Despite the many ways to hold this bar, I felt some numbness after only an hour or so of riding. Since I still had the Cinelli cork tape that I had taken off the old bar, I wrapped it over the leather on the flats and the drops. It doesn’t look as pretty, but is considerably more comfortable. The additional padding also fits my hands better because of the larger diameter. Which leads me to the idea that suppliers should offer bars that are bigger diameter than the current 22 or 25.4 mm sizes. The bus shelter I designed 20 years ago could use a reshingling. 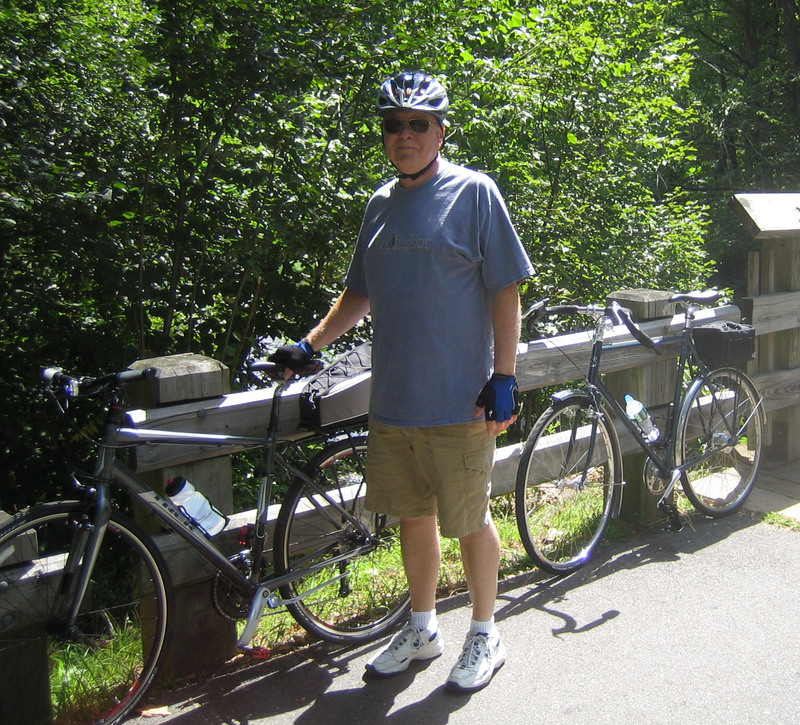 Postscript: The extra padding on the bar is perfect – no sign of numb hands the whole trip. My knee was a bit stiff at the end, but no pain. 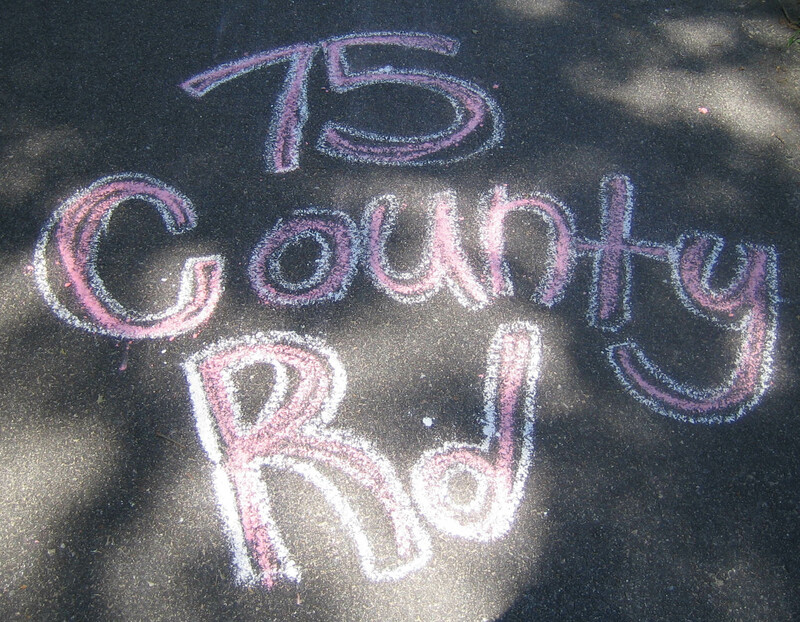 Rhode Island’s South County Rail Trail – officially the William C. O’Neill Trail, after the politician who championed its creation – runs about 6.8 miles between the Kingston railroad station and Wakefield. You can then ride another mile to the waterfront through school grounds and on local roads. 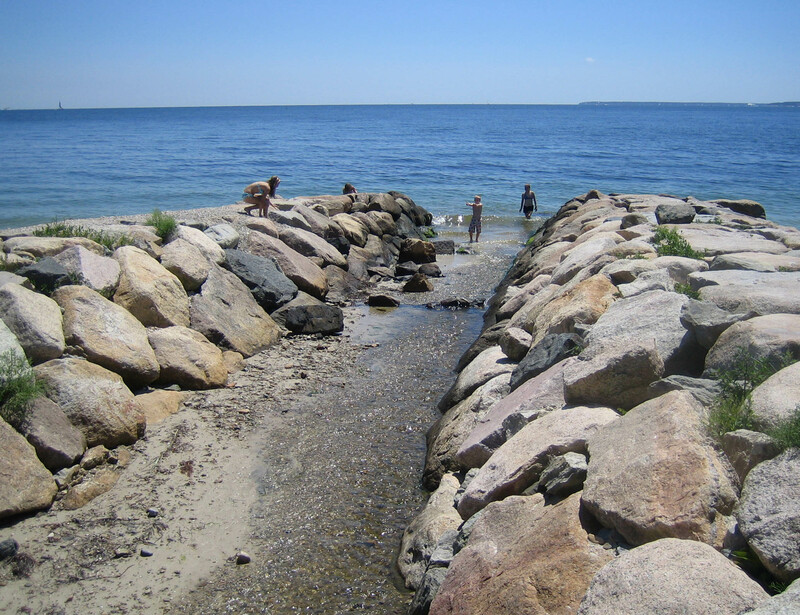 Until 1983 it was the route of the Narragansett Pier Railroad. As you enter Peace Dale from the west, you come to a triple ramp that takes you down to street level. At this point the railroad ran on a long spindly trestle across the village. 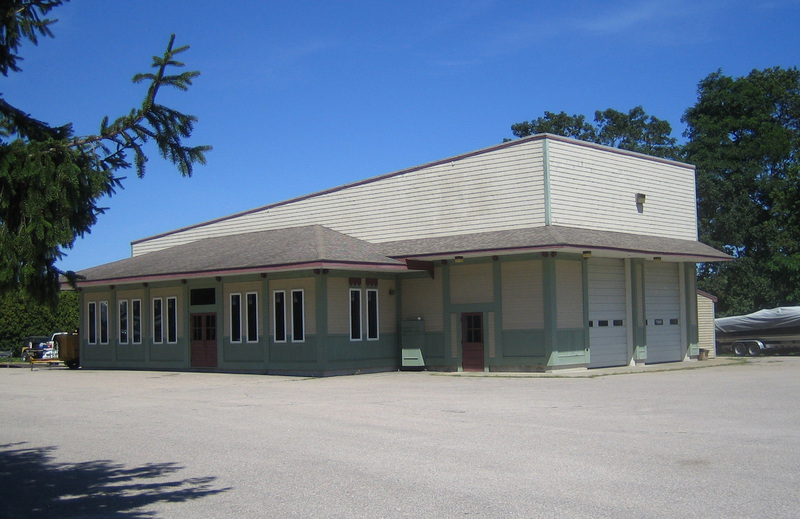 The trestle has been removed, but the railroad station and roundhouse still exist in nicely restored condition. 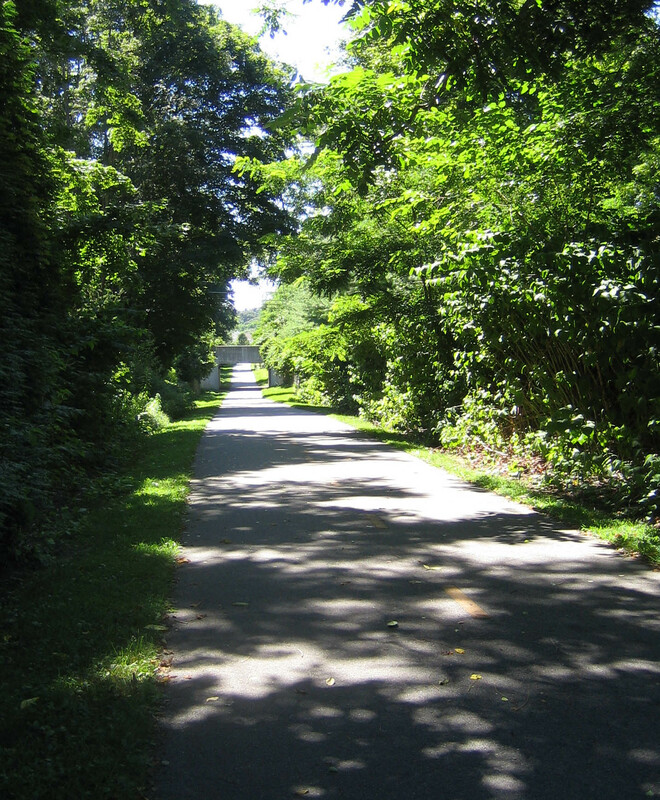 For the next quarter mile the trail follows a wide and lightly traveled local road with a concrete sidewalk. From this point eastward there seems to be too many road crossings. 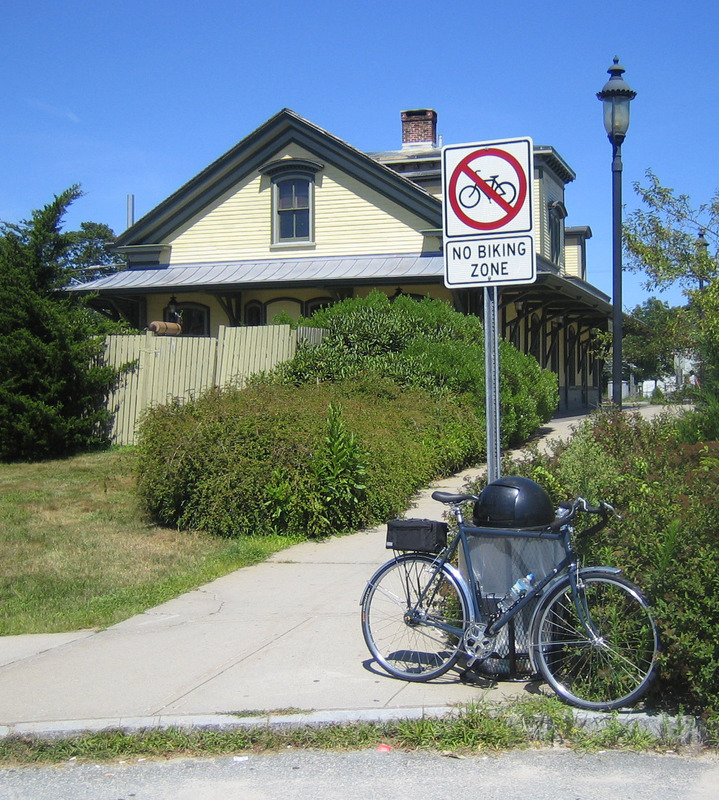 Rhode Island does not give bicycles right of way over motor vehicles, but three did stop for me to cross, including a police patrol car. The busiest crossing has a pedestrian signal. Another way this trail differs from most is that pedestrians are urged to walk on the left, facing bicycle traffic. At first I thought this strange, but in practice I like it a lot, as it cuts out the need to be constantly warning walkers of your approach. And finally, there is a no biking zone in front of the Kingston station, which seems a bit odd for a bike trail, but reasonable when you consider that this is also a busy Amtrak commuter hub. My brother recently retired from a busy career running a nuclear power engineering firm, and – after a thorough engineering analysis – bought a nicely designed and equipped Trek 7.4FX. 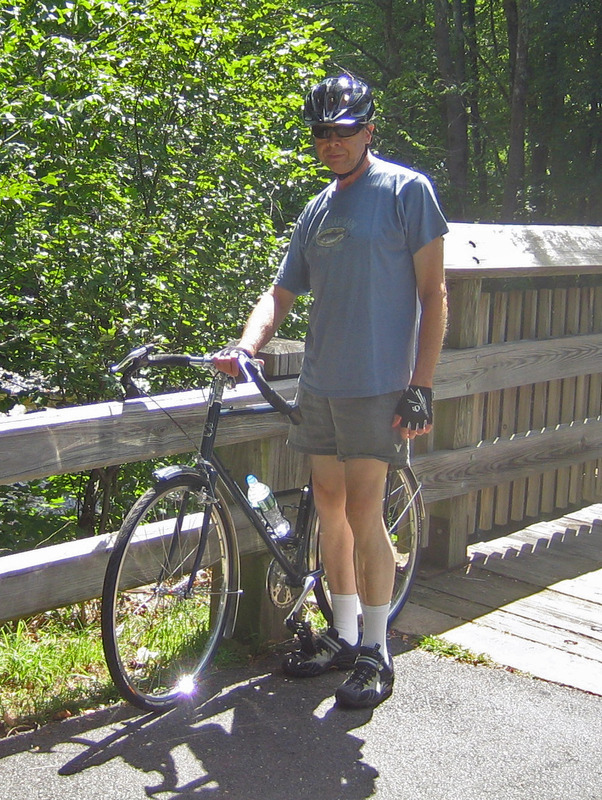 He joined me today for his first rail trail ride: the Farmington River Trail west of Hartford, Connecticut. 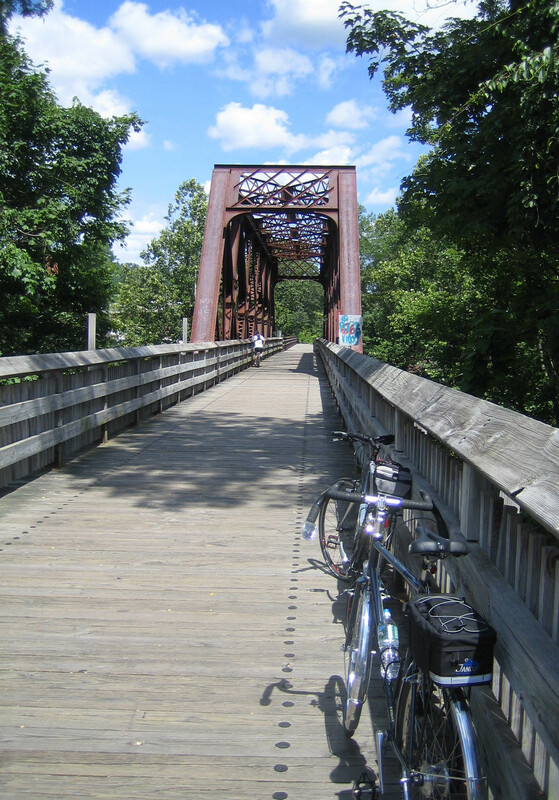 We rode the western portion of the trail – about eight miles round trip – between Unionville and Collinsville. 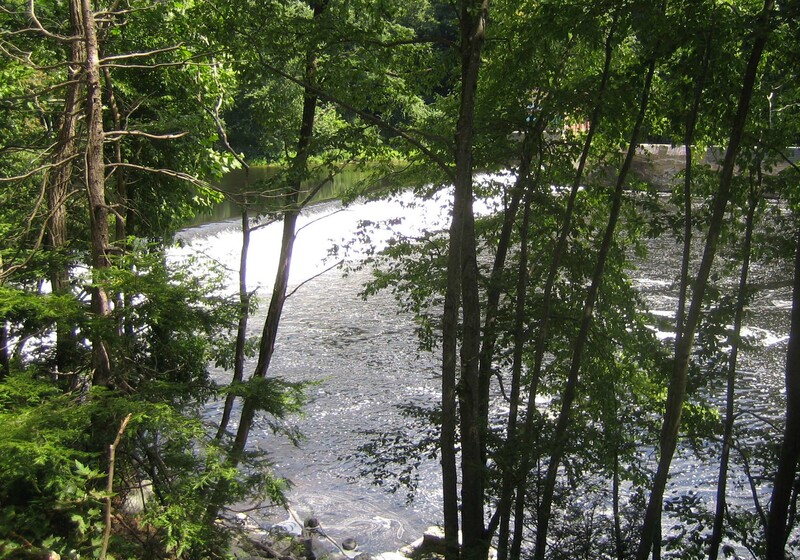 This portion of the trail is very scenic, running along the banks of the river, past old dams and spillways, and through heavily wooded terrain. The last half mile or so before crossing the river into Collinsville follows a lightly traveled local road leading up to the old railroad bridge into town. This is an older trail. As a result, most of it is narrow and heavily broken up by chain-rattling tree roots that demand a slow pace. 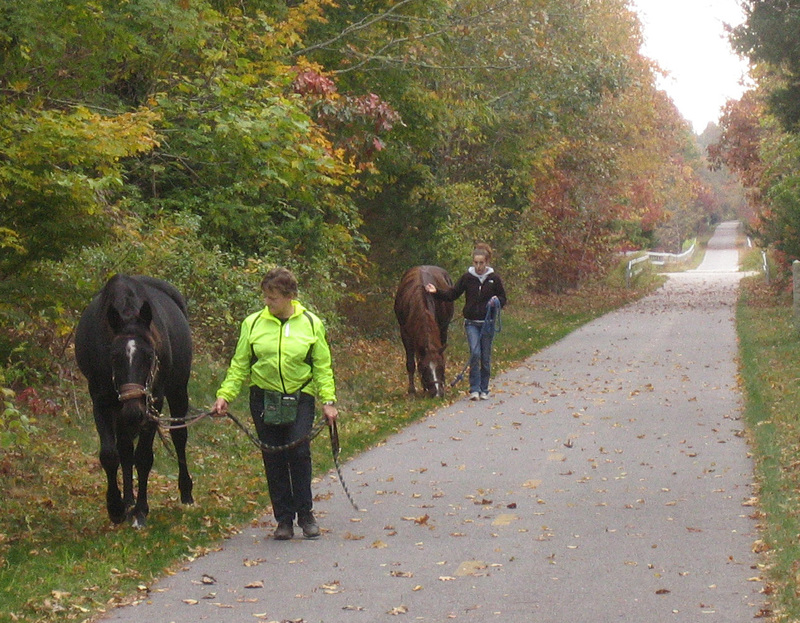 About 1.5 miles of the portion we rode has been rebuilt, and is wider and smoother, with estate-style fencing and stone benches along the way. 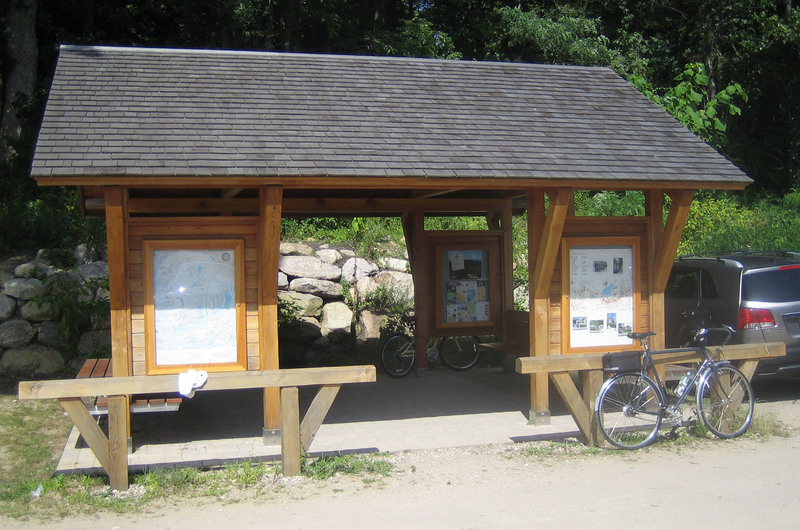 We did not pedal the eastern half of the trail, as I wanted to rest my knees before riding the longer Norwottuck Rail Trail tomorrow. 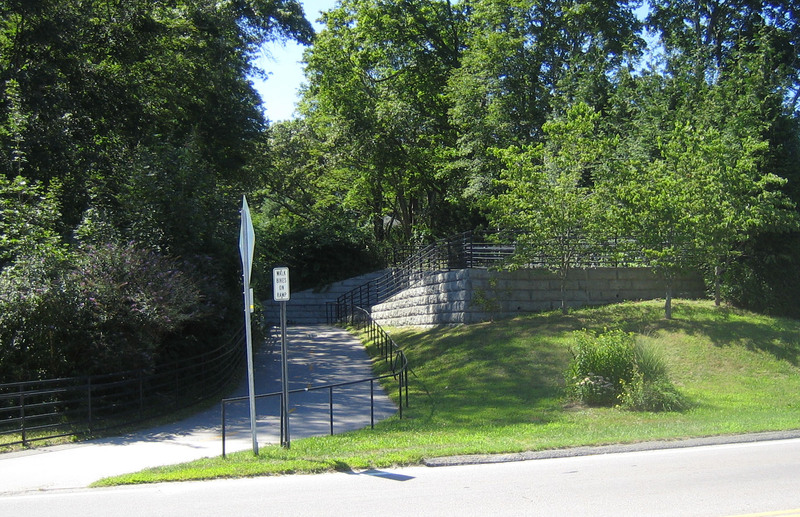 The western end of the Norwottuck Rail Trail lies at the foot of the ramp off I-91 North in Northampton, Massachusetts. A small, shaded parking lot with porta-potties is a welcome site, but the portable sign at the trailhead was not welcome after a long drive. I saw several bicyclists go by, however, so unloaded my bike, put on my helmet, shoes, and gloves, and headed out. 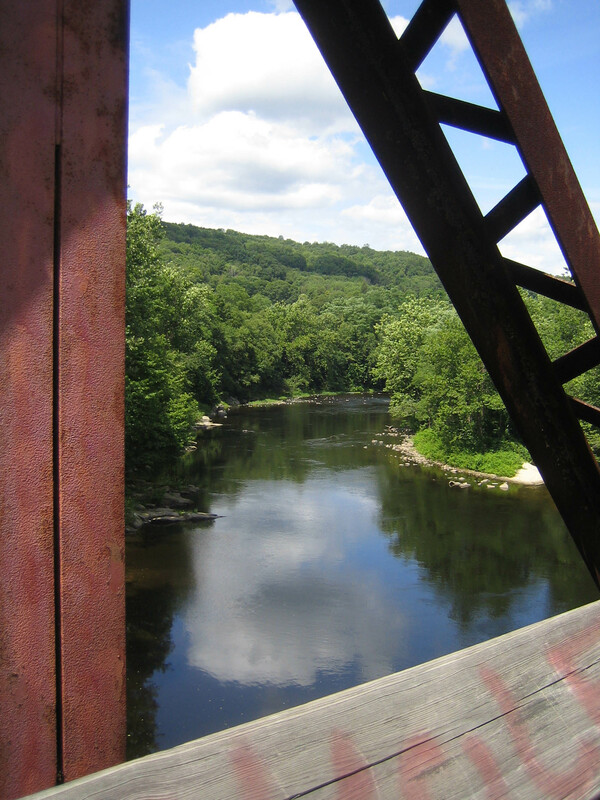 I was able to cross the 1500-foot railroad bridge spanning the Connecticut River and continue about half-mile before being detoured onto local roads. 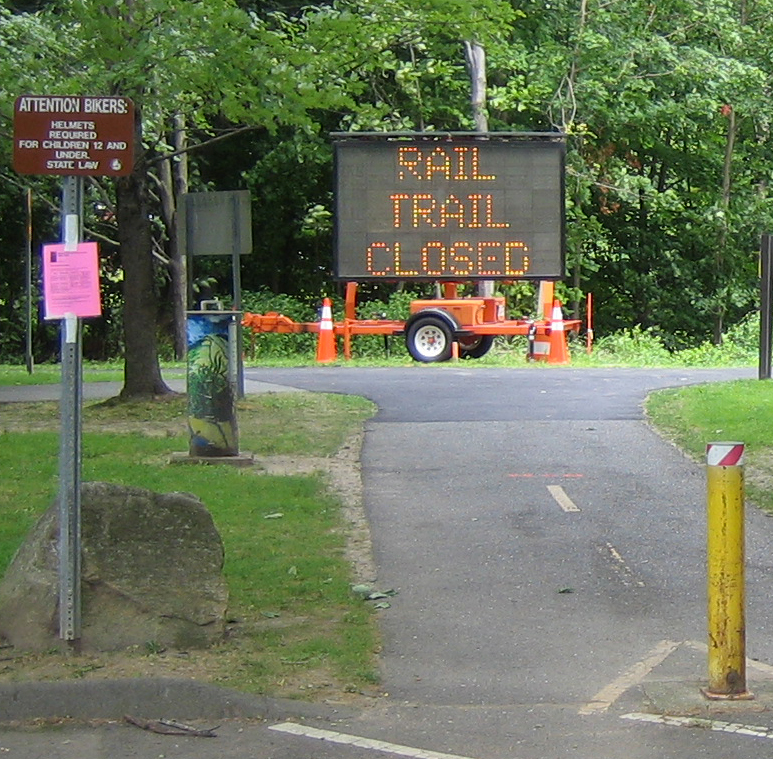 This is another older trail, currently undergoing much-needed reconstruction. 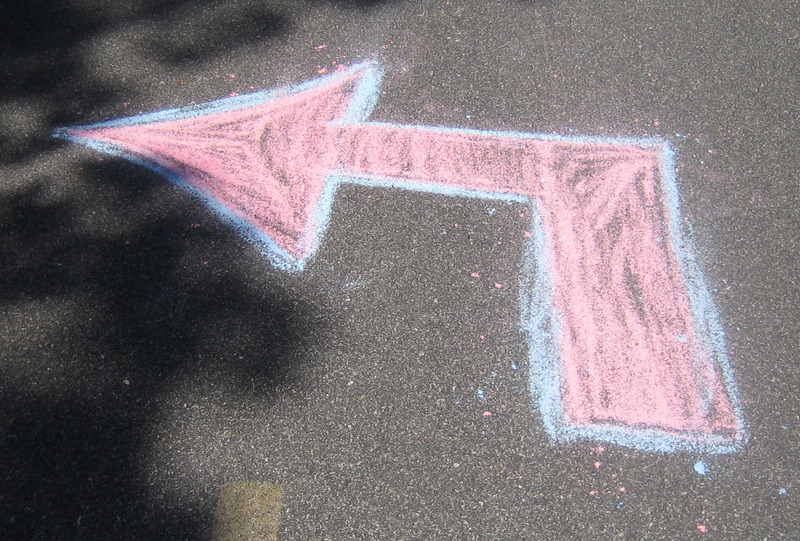 The pavement is narrow and rough. In two places it was apparently paved over the old wooden railroad ties, which have since rotted away, leaving a bone-jarring washboard surface. 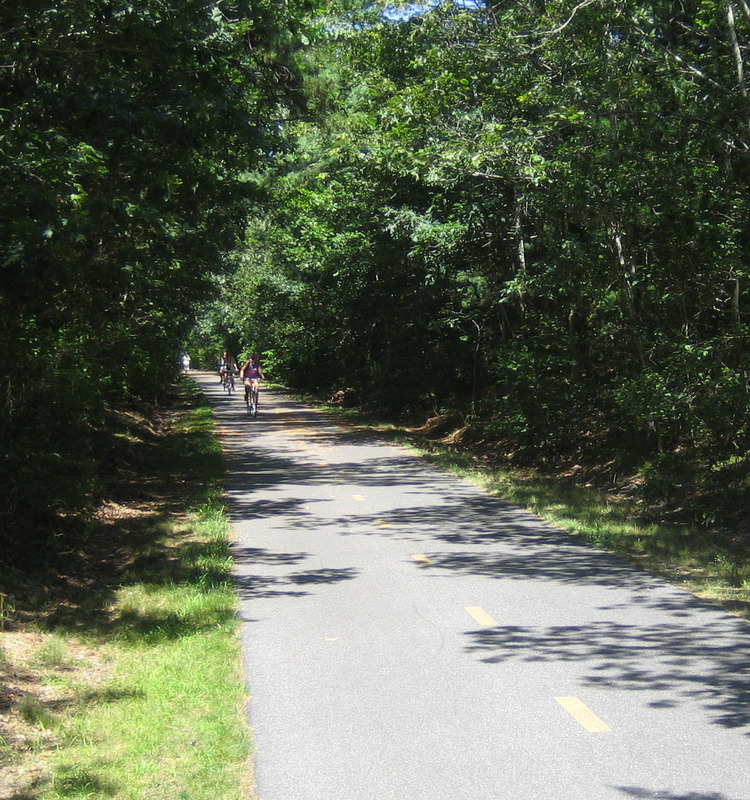 This trail runs through heavily wooded terrain, past farm fields and swamps, for about ten miles. 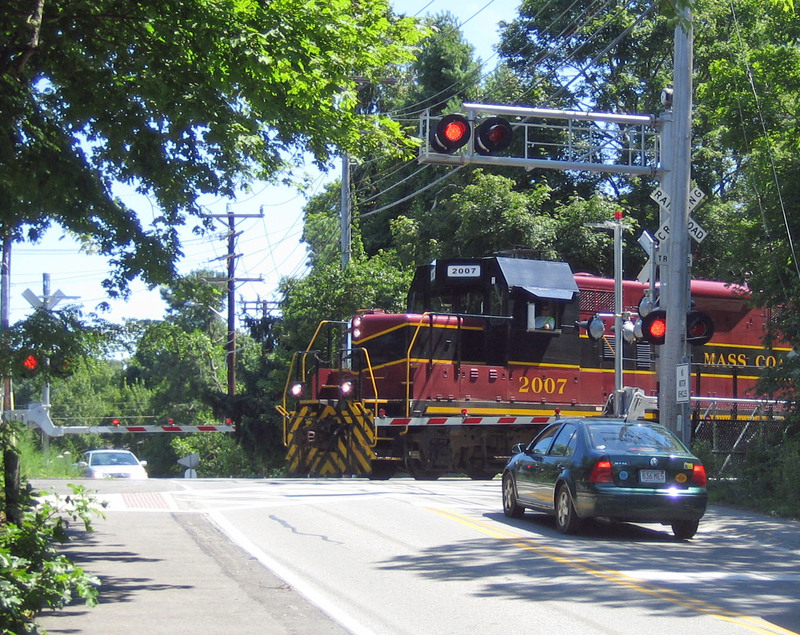 It passes the Amherst College campus and connects with a commuter trail into the University of Massachusetts campus to the north. I graduated from this school half a century ago when it had only 4000 students – a tenth of the current population. I recognized little of the campus, as it has metastasized over most of the northern half of town. My ride covered about 7.5 miles of the trail that was open (15 miles total). It was an enjoyable ride, but I think I will wait until the entire trail is reconstructed before returning. As you can see, I like to take pictures when I bike new trails. It was a pain, though, to have to stop, dismount, open my rack bag, take out the camera, and then reverse the process after taking a shot. I solved this problem by installing a little stem bag that’s just big enough for my favorite old Canon Power-shot digital camera. It’s intended to be mounted on top of the stem, but I chose to attach it to the side so it gets less road shock and doesn’t interfere with the clock. I loop the camera strap around the bell for security. 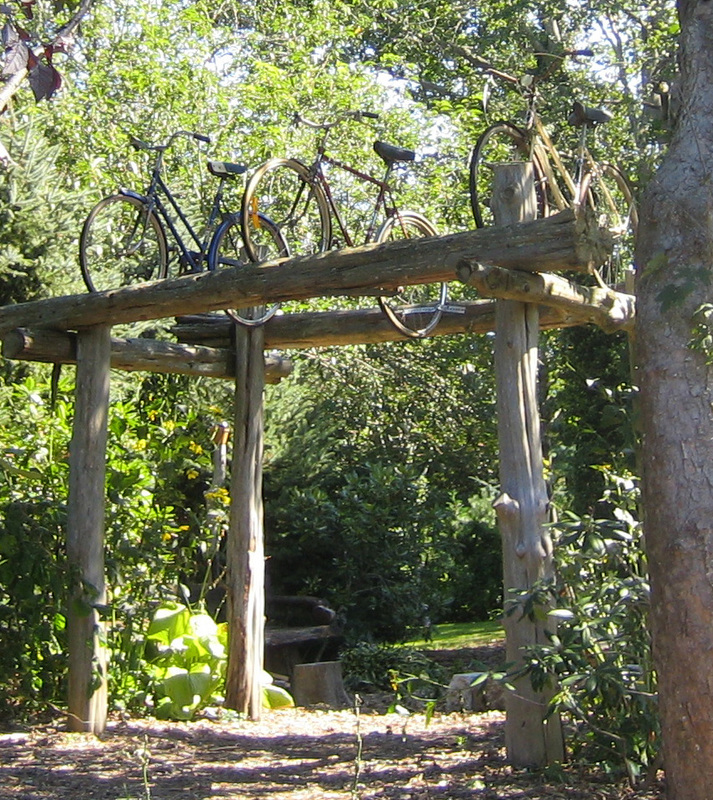 While pedaling the Shining Sea Path yesterday, I noticed this unusual garden arbor next to the trail in West Falmouth. 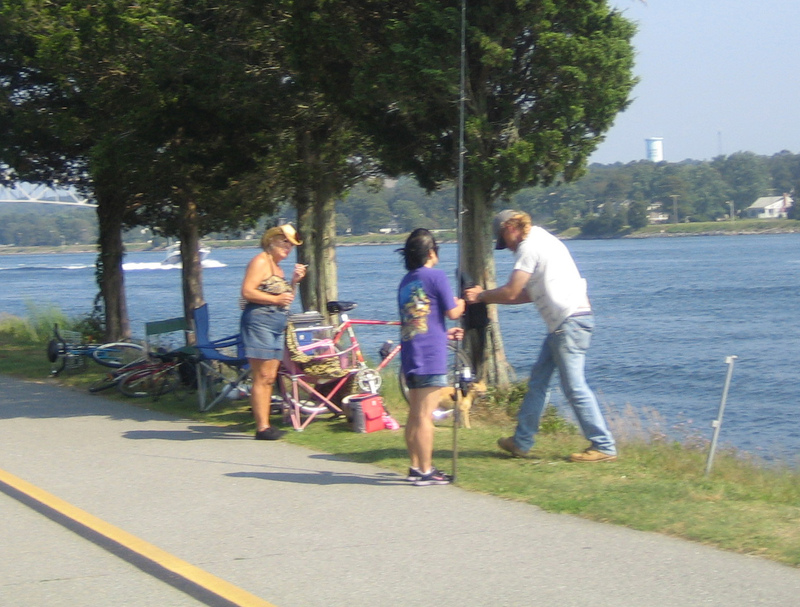 And while pedaling the north side of the Cape Cod Canal today, I came across this woman just as she was reeling in a very large striped bass. 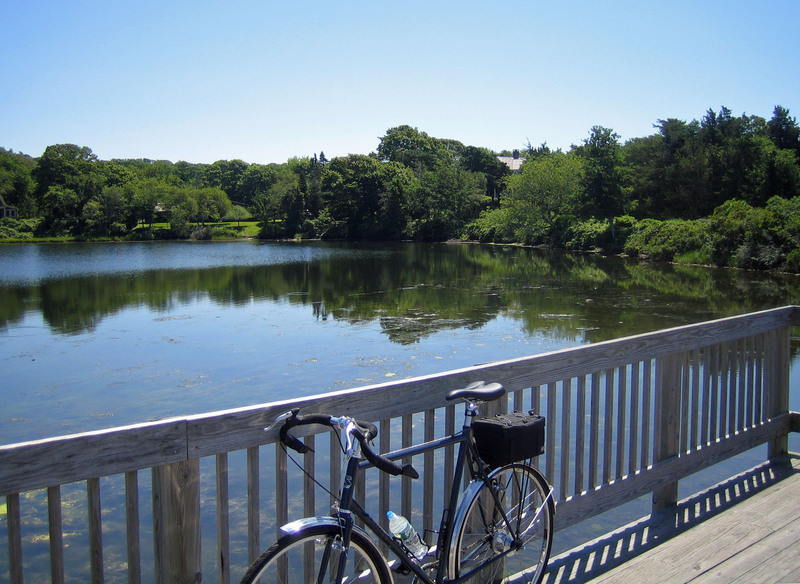 Perfectly perfect fall weather on Cape Cod today, and no work scheduled, so I loaded my bike in the wagon and headed down-Cape to Chatham and pedaled the Old Colony Rail Trail. 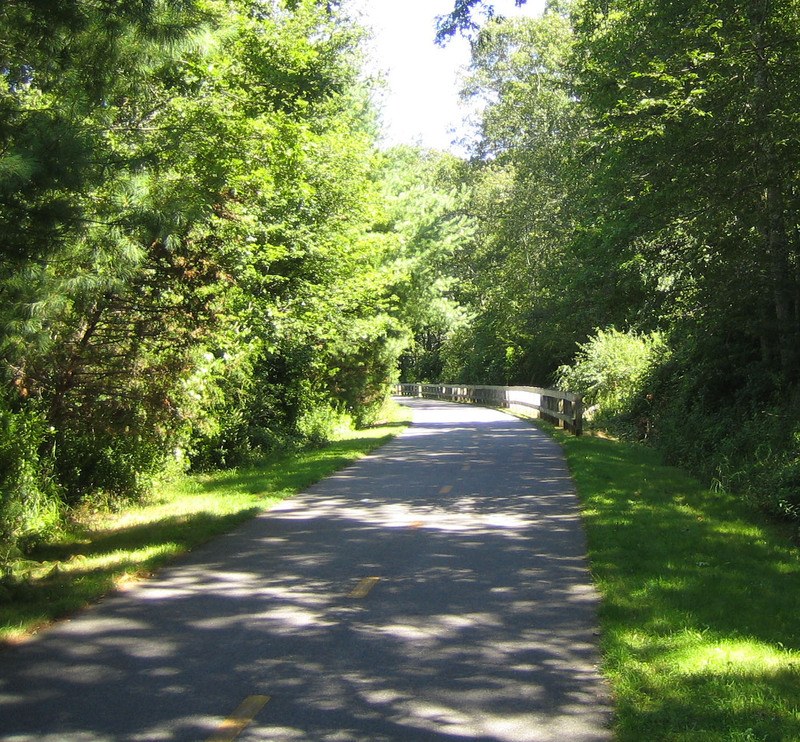 This was the last section of rail trail on the Cape that I had not ridden. 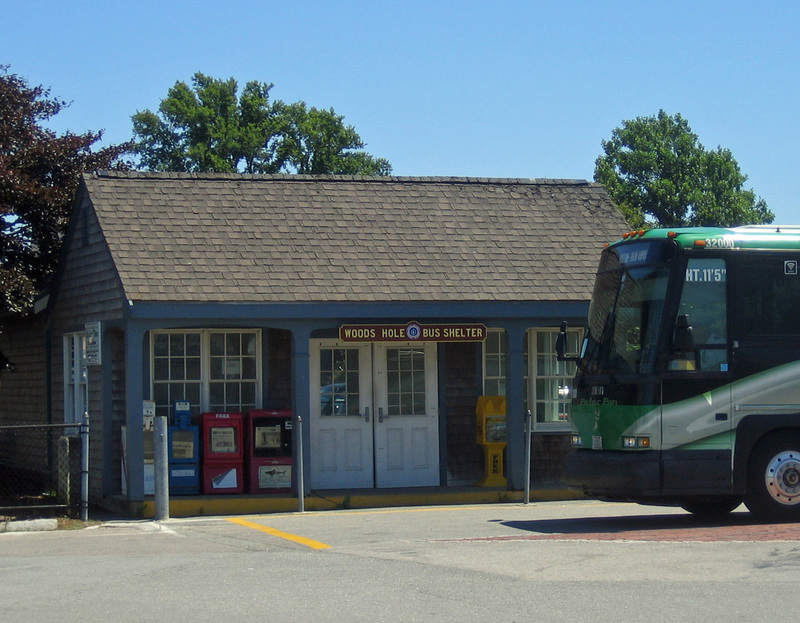 It runs about six miles from Chatham airport to a connection with the Cape Cod Rail Trail in Dennis. This trail is a lot like the South County trail. It is well-maintained, lightly used, and has many easy grades for its full length. It’s not especially scenic, but is a pleasant path through the woods. It wraps around the south end of the airport on a local road, then continues for another half-mile or so, but I didn’t pedal that extension. At one point the trail takes off on a strange loop that apparently keeps it outside of the 500-foot zone around a public well. That is understandable for a road that carries fuel burning vehicles which spew lead, arsenic, and rubber along the road, but seems kind of silly for a bike trail. After logging a few hundred miles with no knee problems, I put the narrower 155mm saddle back on my Surly, and raised it about 3/4″. I find I’m using this bike more often for exercise on familiar trails and less for sightseeing, so I want a more efficient posture with longer leg extension. I bought a set of Velo Orange Zeste cantilever brakes last month, hoping to improve the braking on this bike. The Tektro brakes slow it down okay, but take too long to bring it to a full stop. 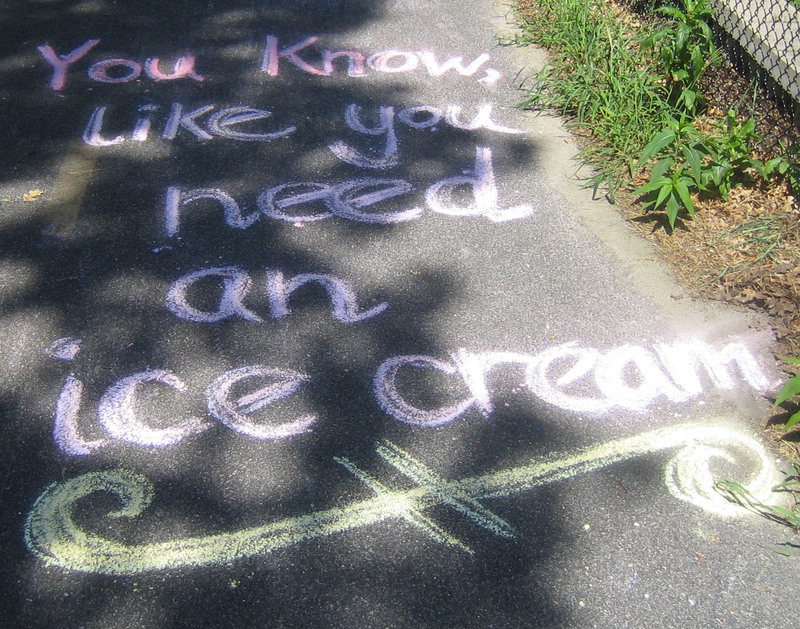 I nearly ran into a young woman running with a baby carriage on the canal trail when she stopped without warning and stepped right in front of me. I’ve decided to save the Zeste brakes for the new Camargue bike that I plan to build this winter (see https://twofootartist.com/dirt-trail-camargue-bike/) so will swap out the Tektro pads for Kool-stops instead. Otherwise, the Surly has proven to be perfect for my size, age, and use. 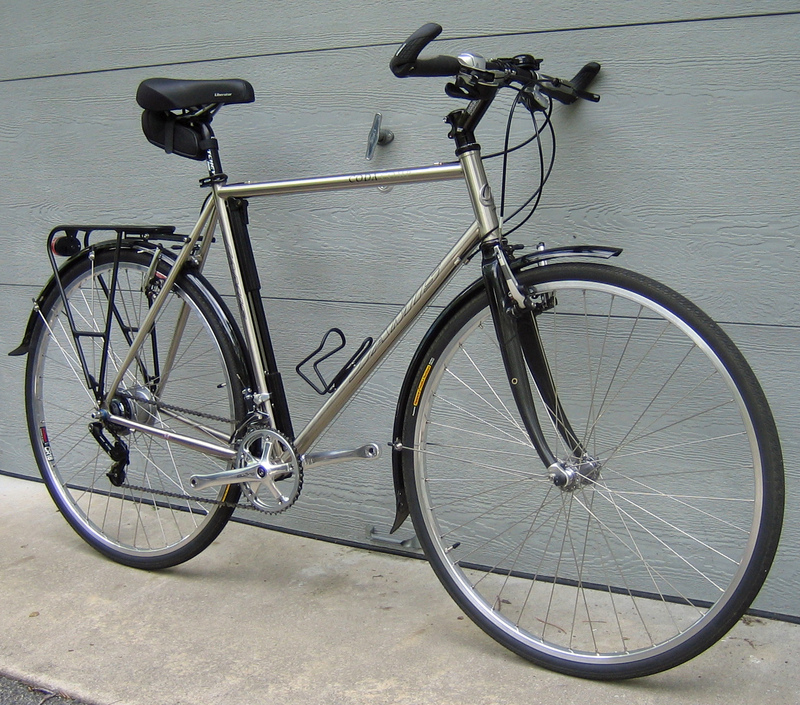 The Weather Service is predicting a wet weekend, so I plan to reconfigure my old Jamis town bike once again. I converted this bike from a 27-speed monster into an internally-geared 8-speed and used it riding rail trails for two years before building the Surly last winter. I then experimented with a 16-speed set-up using two chainwheels that proved highly successful but left the bar cluttered with cables and controls. I had planned to give this bike to my brother, but it turned out to be too tall for him, so I put it up on eBay for sale. After three tries, I had lowered the price to the point where I would be better off either breaking it down for parts or keeping it, so I decided to remove the extra chainwheel and derailleur and keep it for local sightseeing and errands. I’ll also switch out the Kool-Stop brake pads to the Surly. Saw some unusual walkers on the Shining Sea Path today. 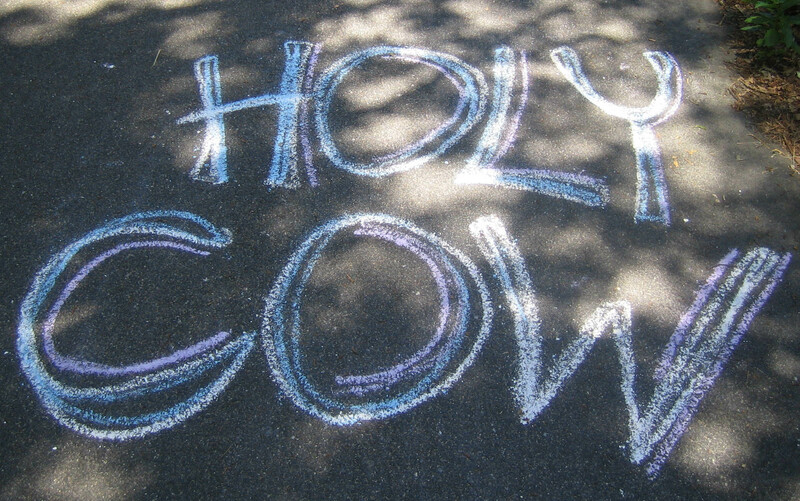 They walked and grazed on the grass, but left their “gifts” on the pavement. Now my bike smells like a stable. The Jamis is now back to being a town bike for running errands and casual rides with friends who don’t like to go fast or far. I removed the front derailleur and double chainwheel; replaced the saddle with a wider and softer one, set at 100% of leg length; and replaced the Alfine shifter with a NOS Shimano Nexus brifter set that I picked up on eBay. …and easier to read. 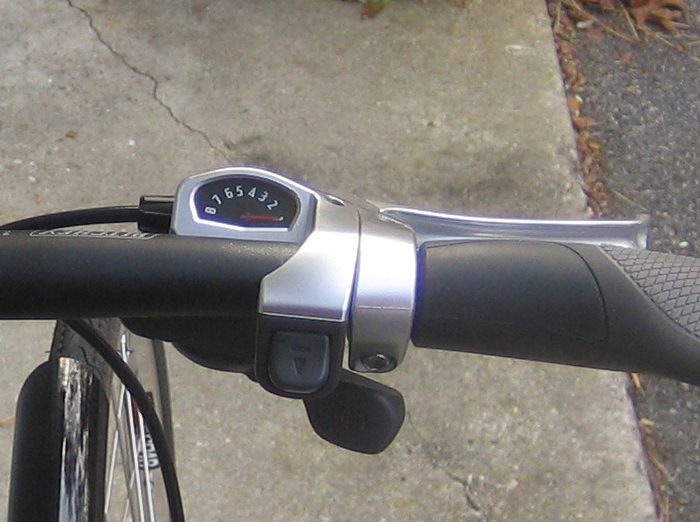 It uses two thumb levers, instead of the opposing thumb and finger levers as on the Alfine shifter. I still plan to add a headlight and replace the Shimano Alfine chain tensioner with a Surly unit that uses a single idler wheel. hello, I’m interested in installing a soma portola bar on my moutain bike. I read that the clamp diameter is 26 mm. Does it fit correctly in a stem intended for 25,4 mm diameter bar? No. You will have to change the stem. You can shim a larger stem to fit a smaller bar, but not the other way around. Hey, what a beutiful bike. congratulations. 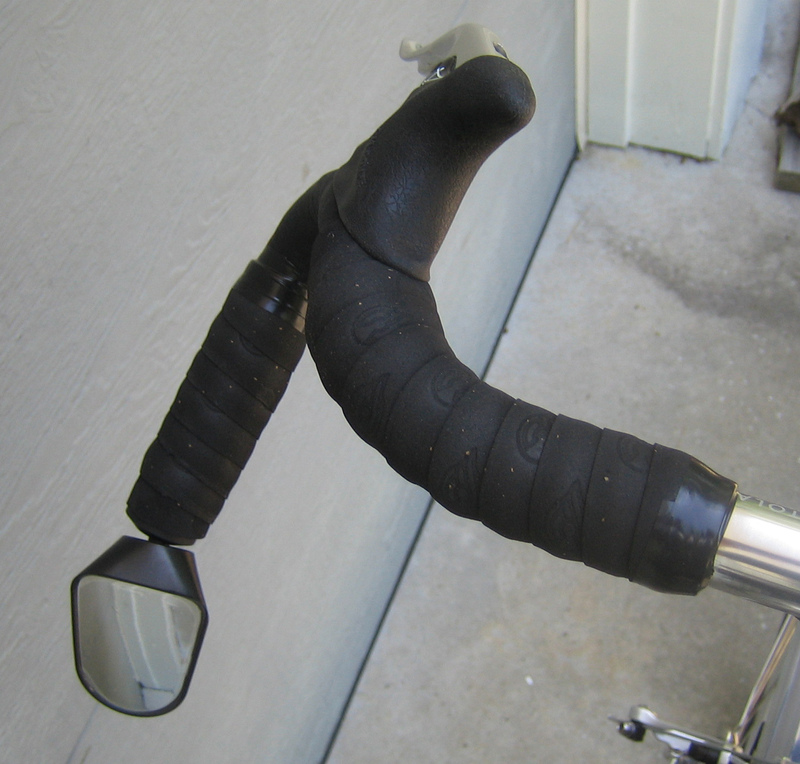 I would like to buy a soma handlebar like yours. But i have a concern about the size. Right now i have a Surly LHT, size 58, with the stock handlebar (44 cm) and i feel it ok. Do you have any idea about how to choose the correct size for the soma: 56 cm or 53 cm. I’ve used both on my Surly Cross Check and prefer the 53. I put the 56 on my VO Camargue, which is more of an off-road bike. I think that I would choose the 56 because my intention is to run the Tour Divide with my Surly LHT. And I understood that the 56 could be more off-road oriented.